for their pictures of Stag and Holly fakes, which clearly illustrate the differences that identify the fake pieces. ​Stag and Holly is a very popular pattern. It was made by Fenton in Classic Carnival Glass in two main shapes - a spatula-footed 8" bowl and a ball-footed 10" bowl. Also produced from these two basic shapes were spatula-footed 9" plates, ball-footed chop plates and a ball-footed giant rosebowl. However, there are fakes of the large, ball-footed bowl. 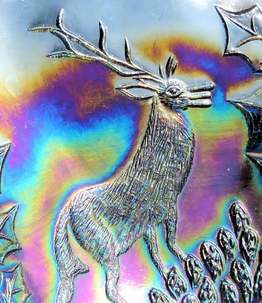 Although fakes have been around since the early 1980s, they continue to mislead collectors, judging by the many enquiries we see in all the places where Carnival Glass, Fenton, and other antique and vintage glass is discussed. The Fenton originals, being Classic (old) Carnival Glass are not marked "Fenton" - Fenton only started trademarking their contemporary Carnival glass when they reissued it from the 1970s, so the absence of a Fenton mark is no guide whatsoever to identifying the fakes. It is important to know how to tell the genuine article from the fakes. The fakes are thought to have been brought to the USA from Korea by 'A.A. Imports' from as early as 1982. Examples bearing a small oval and gold sticker marked "Made in Korea" have been seen. It is possible, however, that other makers have also produced the fake "Stag and Holly". The fakes are not being made from the original Fenton mould so there are a number of pattern differences that show the fakes. It is also important to know that there have been several changes, tweaks and alterations to the fakes over time to try to make them look more like the originals. UPDATE December 2018 - with thanks to Marty Miller. Marty Miller posted these pictures on our Carnival Glass Worldwide Facebook Group, and we are grateful for his permission to share them with you. They show yet another iteration of this fake piece. The stags do not have tongues, but now they have very strange triangular-shaped antlers, very stiff looking legs, and a stubby tail - see detail picture below, right. The ways to identify the fakes that have been reported to date are set out below .... BUT we can't rule out if there are other versions of the fakes, or whether they have been made in colours other than those listed. Essentially, if you see a large ball-footed "Stag and Holly" bowl in black, purple, blue, red or white, you should be thinking "Is this a FAKE?" The features listed below will give you the answer. Shape: so far, only the large (9 - 10") ball footed bowl appears to have been reproduced. The fakes are "as moulded" and very regular. The original Classic versions were shaped by hand, or with a crimp and show the variation that was produced by hand-finishing. 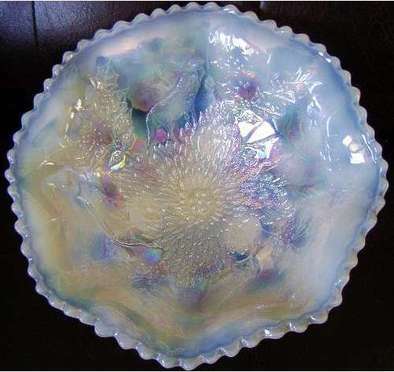 Colours: in Carnival, the following have been reported - black, deep purple, purple, blue, red, white (a sort of pearlised opal as shown here). Characteristics: heavy, thick glass, much heavier than original Classic Carnival versions. Pattern Differences: think tongue and eyes! Tongue - on the Fenton originals the stags have a tongue and it extends beyond the mouth. If there is no tongue, it is a fake. WARNING .... more recent fakes now come with tongues - but on the fakes the tongue and mouth look like three oblong cigars all at the same length (see pictures below). Eyes - on the originals, the eyes on the stags are oval / almond shaped. On the fake the eyes are noticeably round. Neck - on the originals, the neck of the stag is thin and more elegant. The fur is more textured and finely moulded. On the fakes, the neck is thick and "chunky", and the moulded texture of the fur is a series of parallel lines. Antlers and Tail - the most recent version of the fake reported to us by Marty Miller (December 2018) shows a very different looking stag. The antlers are now very crude triangular shapes (replacing the branched ones), and the stag now has a stubby little tail - as pictures above. Holly berries - there are differences in the arrangement of the berries on the sets of holly sprigs. However, it is not that easy to count berries or see the differences, especially as some of the fakes are poorly moulded and the berries are less easy to count. The iridescence also interferes. The head - eyes and tongue - are much easier to see. Once you know the differences, the fakes should not be difficult to spot. Above left: the Fenton original. 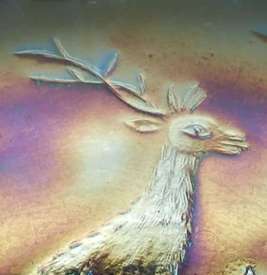 It has oval / almond-shaped eyes, and a thin tongue that extends beyond the Stag's mouth. Generally it is finely moulded. Above centre: the earlier a fake version which did not have a tongue. Above right: a later fake - a "cigar-shaped" tongue has now been added (courtesy of Sharon A Whitehead-Smith). Below, left and centre images, (thanks to Andy in Rapid City, SD) is another fake version. It has a cigar-shaped tongue, and the tongue and the jaws are very crudely moulded - like "three oblong" cigars". The stag has more rounded and more prominent eyes. The stag's neck is far more thick-set and the texture of the fur is a series of parallel lines. The image on the far right is explained in detail below. * the image above, far right is the latest version reported in December 2018 - the stag has been extensively re-modelled. It has no tongue (the mouth is just a thin slit); it has very strange-looking triangular antlers, it has very stiff legs; and it has grown a short stubby tail (picture courtesy of Marty Miller).